In MCQ type tests, usually time is very limited. You have 2 minutes or one and a half minute for each MCQ, so divide the time on all MCQs properly. This does not mean divide time equally. For example Maths MCQs may take more than 2 minutes to solve while English MCQs should take lot less than 2 minutes. Read the MCQ and before reading the choices, think in your mind for correct answer and then read the choices. It will help you to choose the correct choice or the answer. There will be some choices that would surely know are wrong, skip these wrong choices first and focus on the rest choices for correct answer. It increases your chances to select the correct choice. You can make better “Tukkas” this way. Solve those MCQs first, which you can easily answer. Leave the difficult ones for last. If you stick to one MCQ trying to find its answer and it takes your time, leave it because it hinders and when you finish all MCQs then come back to the un-attempted MCQs. For answering MCQs you are given a “computer sensitive sheet”. It has blocks or circles on it. You have to use your pencil to fill the block or the circle for correct answer. Learn the correct way how to fill blocks or circles on computer sensitive sheet because computer reads it for giving you marks. Some tests like NET are computer based. Use pakprep.com mock tests to practice NUST NET and other entry tests. Some student find it easier to mark all MCQs in the answer sheet in the end. Rather than marking all MCQs as you go along. This technique is helpful if you plan to leave some MCQs for the end. Remember if you mark answer of MCQ no 10 in the answer sheet for the space given for MCQ no 11 you will have all answers wrong. Computer only reads your answer sheet. If there is not negative marking answer all MCQs in the answer sheet. Practice sample entry tests in timed environment. These let you know how you perform under time pressure. Pakprep.com has sample timed tests for all major engineering and medical universities in Pakistan. Click the links below to try one without registering! these tricks for solving mcqs are very useful for nust NET and also for entry test of other universities. sir, please tell me that from which book should i prepare for my bahria’s software engineering test? 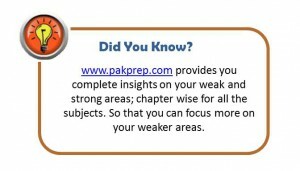 We appreciate your interest using pakprep.com. Please follow the bellow mentioned link to get register your self at http://www.pakprep.com. We have all relevant material for the preparation of Bahria university test. We appreciate your interest in using pakprep.com. Bahria University test will be same like NAT-IE. We have all material for the preparation of test. Please follow the bellow mentioned links for your preparation. We appreciate your interest in using pakprep.com. We suggest you to cover all topics of your course book and than Login to http://www.pakprep.com to practice maximum MCQ’s it will help you in scoring good marks. sir, please tell me that from which book should i prepare for my bahria’s mbbs test? We appreciate your interest in using pakprep.com. We have all the material for the preparation of MBBS test. Please follow the bellow mentioned link to register yourself and get more than 15000+ MCQ’s with answers and explanation. sir, please tell me that from which book should i prepare for my bahria’s bscs test? Sir please tell me from which book should I study for bahria’s environmental Sci test ?